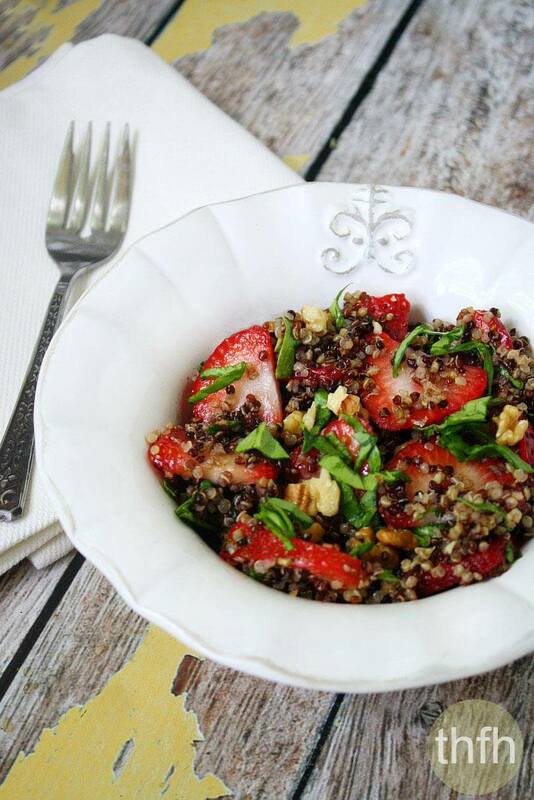 This super easy Strawberry and Spinach Quinoa Salad with Balsamic Vinegar is a perfect summer lunch that’s made with only 5 clean ingredients. I love adding fruit to my salads like my Watermelon Salad with Clean Eating Watermelon Vinaigrette and my Blueberry Mango Salad with Tahini Ginger Dressing because it keeps it light and is perfect for the hot summer months. Another great thing about this dish is it’s a great way to use leftover quinoa for a quick lunch the next day – just toss everything into a bowl and you’re ready to go! It seems every time I make a batch of quinoa for something else, I always have 1 or 2 cups leftover and have to try to think of something to do with it…which is how I came up with this recipe! I used rainbow quinoa to make mine, but any variety of quinoa would work so just use what you have on hand or your favorite. I added chopped walnuts to give it a little texture and healthy fats, but you could leave them out if you’d like or add another nut like pecans or even hemp seeds. This healthy lunch recipe is made with real, whole food ingredients and is organic, vegan, gluten-free and dairy-free. Want more healthy meal and entrée recipes? Check out Raw Stuffed Kale Leaves with Mint Cashew Aioli, Shredded Brussels Sprouts Salad with Cranberries and Maple Tahini Dressing, Vegan Chickpea Apple Pecan Salad or my Clean Eating Cookbook with an entire chapter of 20 healthy, clean eating recipes just like this one that you will love! My favorite places to buy organic ingredients online are Thrive Market and Vitacost. Make sure you check out my Shopping Resources section to see all the places I purchase ingredients and equipment to make the recipes on my website! Step 1 Prepare quinoa: Prepare quinoa according to your package directions. You will only need (1) cup cooked for this recipe. Add all ingredients to a medium or large sized bowl and gently toss until everything is mixed well and evenly distributed. This recipe will make (1) large serving or (2) smaller servings. 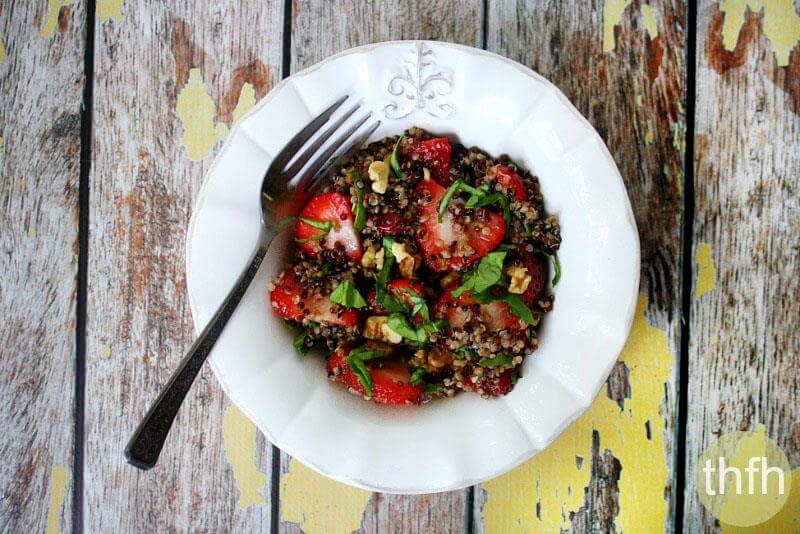 The recipe and photographs for "Strawberry and Spinach Quinoa Salad with Balsamic Vinegar" by Karielyn Tillman of "The Healthy Family and Home" website are licensed under a Creative Commons Attribution Non-Commercial 4.0 International License and cannot be used without my written permission.